Gluten intolerance – myth or misunderstood? For complete article, see link at the bottom of this post. This is a very interesting article about gluten being the possible cause of intestinal problems (celiac disease) and the relationship of intestinal problems and FODMAP (The acronym stands for “fermentable oligo-saccharides, disaccharides, mono-saccharides and polyols). ‘If I eat artichokes, I get cramp and wind’. But, what type of artichokes? There are two types of artichokes, the leafy Globe artichokes and the tuber Jerusalem artichokes. Globe artichokes have NO relation of the tuber-like, Jerusalem artichoke. In my experience problem “artichokes” are more than often he tuber variety, the Jerusalem artichoke. In many other cultures when one mentions “artichoke”, Globe artichoke is the one that they think of. The Globe artichoke is considered to be the ‘true’ artichoke – one of a large member of the thistle family. Globe artichokes are beneficial – liver, kidneys. The Jerusalem artichoke grow as tubers of tall, herbaceous perennial plant that grows up to 3 m high with a yellow flower like a sunflower and this is why the tubers are also referred to as a sun-choke. In Italy the tubers are called Girasole- sunfllower because of the plant’s resemblance to sunflowers. As a person who appreciates and offers stuffed Globe artichokes to many friends during the artichoke season, I want them to know that they are not likely going to suffer. Stuffed artichokes, I can’t get enough of them. Carciofi are artichokes; farciti, imbottiti and ripieni all mean STUFFED in Italian. If you are invited at my place for dinner during artichoke season it is very likely that one of the courses will be stuffed artichokes. I braise stuffed artichokes in stock and white wine and all the stuffings have a proportion of breadcrumbs (1- 2day old good quality bread). Two lots of friends last week, two lots of artichokes and two more recipes. Although I braised the artichokes in stock and white wine, tomato pulp (canned or passata) are an option and would compliment the flavours of the following stuffings. The cooking time will depend on the type and maturity of the artichokes. Sometimes I have found that they take 40 minutes and at other times almost double the time. To test if the artichokes are cooked, pull on one of the outside leaves – it should detach easily. There may or may not have a fuzzy choke, depending on the maturity of the plant. If there is, remove it with a teaspoon, carefully turning it without snapping the sides of the vegetable. Prepare the stuffing: Place all of the ingredients together in a bowl and combine them with your fingers. The mixture is the same as when making meatballs. Clean the artichokes, see: CARCIOFI (Artichokes and how to clean them and prepare them for cooking). Trim the stalk with a small sharp knife to pull away the tough, stringy outer skin (just like the strings of celery). Keep the artichokes and the stem in acidulated water (water and lemon or water and a little white vinegar) until ready to stuff. Drain the artichokes, remove the outer leaves of the artichokes and cut off the top. Use your fingers to spread out the leaves; the stuffing will go mainly in the centre of the artichoke. Sprinkle a little salt between the leaves. Stuff the centre of the artichokes – I use my fingers; press the stuffing firmly into the centre. Pour the rest of the olive oil in a pan and heat it. Place the artichokes upside down into the hot oil – this will brown the meat stuffing. Turn the artichokes the right way up i.e. standing upright so that they can cook in an upright position (choose your pan carefully). Add braising liquid. The level of the braising liquid should be about 1 cm below the top of the artichokes. Add a little salt to the braising liquid. Cover and cook artichokes over low-medium heat for about 50- 80 mins. The cooking time will depend on the type and maturity of the artichokes. Peas can be added during the braising – add these about 20 minutes before the cooking is finished. Cheese: I used pecorino fresco but a sharper cheese like provolone or mature pecorino or parmigiano would also be suitable. There may or may not have a fuzzy choke, depending on the maturity of the plant. If there is, remove it with a teaspoon, carefully turning it without snapping the sides of the choke. Press one cube of cheese into the centre the stuffing so that it is covered. Place the rest of the oil in the pan and arrange the artichokes standing upright so that they can cook in an upright position (choose your pan carefully). Cover and cook artichokes over low-medium heat for about 50- 70 mins. The cooking time will depend on the type and maturity of the artichokes. Present with cooking liquid around them. My favourite Italian vegetable is the carciofo – artichoke. These have been eaten in Italy from ancient times and especially appreciated during the Roman period. They were then grown extensively in Sicily and Naples particularly around the 9th century. Italians still love artichokes; they stuff them, boil, braise them, roast them in ashes, fry them and preserve them with the help of olive oil. They are used to make risotti, pasta sauces, frittate. 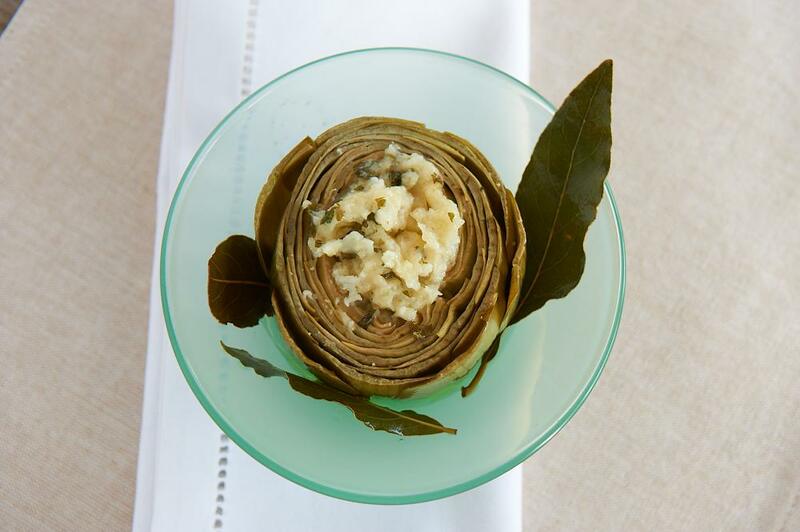 Older artichokes are stripped of all their leaves and the tender ‘fondo’- base – is stuffed and braised or baked. Tender raw artichokes are sliced thinly and eaten raw as a salad with a dressing and in Sicily made into a caponata. Older artichokes are stripped of all their leaves and the tender ‘fondo’ (base) is stuffed and braised or baked. And the stem of artichokes, once stripped of its fibre is as appreciated. One of my most favourite ways to eat artichokes is to stuff them with fresh breadcrumbs, grated cheese, garlic, parsley and then braise them in white wine and stock. There are many regional and local variations for the breadcrumb stuffing all over Italy and probably the most common is the addition of anchovies. Different herbs or the addition of minced meat are also enjoyed in some regions. The stock can be water, vegetable or meat stock and /or white wine. Some also use tomatoes (peeled and chopped or blended tomatoes) as the braising liquid. Ricotta is sometimes combined with fresh breadcrumbs and used for the stuffing and because nuts – pine nuts, almonds or pistachio – go well with ricotta I chose almond meal and some pistachios. Instead of parsley I added basil, a much sweeter herb, and finally nutmeg, a spice generally used with stuffings in the northern parts of Italy especially if ricotta or mince meat is used. Trim the stalk with a small sharp knife to pull away the tough, stringy outer skin (just like the strings of celery). Keep the artichokes and the stem in acidulated water until ready to stuff. Prepare the filling by mixing together in a bowl the breadcrumbs, seasoning, herbs, nutmeg, ricotta and 2 tbs of olive oil. Drain the artichokes, remove the outer leaves of the artichokes and cut off about 2 cms of the top. Use your fingers to spread out the leaves, the stuffing will go mainly in the centre of the artichoke. There may or may not have a fuzzy choke, depending on the maturity of the plant. If there is, remove it with a teaspoon, carefully turning it without snapping the sides of the vegetable. Sprinkle a little salt between the leaves. Stuff the centre of the artichokes – I use my fingers, press the stuffing firmly into the centre. Pour the rest of the olive oil in a pan. Place the artichokes into the pan standing upright so that it can cook in an upright position (so choose your pan carefully). Add a combination of water, stock and white wine as the braising liquid (I used little wine and mainly vegetable stock). The level of the braising liquid should be about 1 cm below the top of the artichokes. Add a little salt to the braising liquid. Cover and cook artichokes over low-medium heat for about 40 mins. We are now well into autumn and the green artichokes have been in season for a few weeks now in Victoria (see photo above) and soon we will also have the purple tinged ones – all Victorian produce. • stuffed in a variety of ways, then baked or braised. 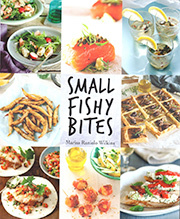 Photo below: Photographer Graeme Gillies, food stylist Fiona Rigg. 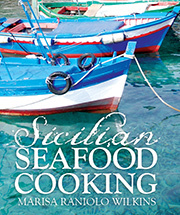 Both worked on my book, Sicilian Seafood Cooking. My brother who lives in Adelaide uses egg and no cheese in his bread and herb stuffing so when I visit him I am pleased that they are a little bit different. Last time I ate artichokes at his house he added peas (which I often do) and we had the peas, stalks and juice as a pasta dressing and the stuffed artichoke as a second course. Cardoons will also be in season in winter. There are two words for carciofi in the Sicilian dialect, cacocciuli. and carcioffuli. The Italian word for artichoke is carciofo and carciofi is the plural. And were would Italian cooking be without artichokes? My favourite way of cooking artichokes is the simple way that my mother has always cooked them. My maternal grandmother Maria (originally from Catania but who lived in Trieste for about 20 years) also cooked them this way. She used the same mixture to stuff sardines, tomatoes and artichokes. I researched Sicilian recipes for stuffed artichokes and found that they are all braised in the same way, but there are regional variations in the stuffing, for example in some parts of Sicily they add mint, others include eggs, some minced onion, or more cheese and even salame. In Australia, although artichokes are now widely available, they are still thought of as exotic and possibly difficult to prepare. Exotic? Yes, maybe – for their unique taste and appearance, but once you know how to prepare them, they are simple to cook. You may need to tell your friends how to eat them (most will attempt to eat artichokes with a knife and fork). Select and clean the artichokes carefully (as described in my previous post, Carciofi – artichokes and how to clean them). Cut the bases off flat so that they can stand up in a saucepan. Select the size of the saucepan carefully – you do not want them falling over, the artichokes should be close together. Do not forget to include the cleaned stems to add to the braise and keep the artichokes in acidulated water as you work. I include one artichoke per person and each artichoke only needs 2-3 teaspoons of stuffing. STUFFING: Combine the ingredients for the stuffing in a bowl. This ratio is good: 1 tablespoon of fresh breadcrumbs (made of good quality bread), 1 teaspoon of each – chopped parsley, extra virgin olive oil and grated cheese (you can use parmesan, but generally pecorino is traditionally Sicilian) and some chopped garlic to taste. Drain the artichokes, spread the leaves (especially in the centre) and sprinkle salt and pepper in between the leaves. Push the stuffing mainly in the centre and if there is any left over, between the leaves. I use my fingers. Arrange the artichokes standing upright in a pan, put the stems between them and drizzle well with more extra virgin olive oil. Add enough cold water to reach to about 1cm below the artichokes. Cook slowly with a lid for about an hour. Having lived in Trieste, I always add a splash of white wine and sometimes a little stock or a good quality vegetable stock cube to the poaching liquid. If you are adding peas, broadbeans and/or potatoes just add them to the poaching liquid. The potatoes can go in at the same time, the peas and broadbeans about 15 minutes before the artichokes are cooked. ‘Those Italians’ would cook them all at the same time –they like their food overdone, but maybe they are right and there is more flavour. I like to present carciofi as a single course – they are too fiddly to eat as an accompaniment to a main course. Key in “artichokes” in search button for more artichoke recipes.